This is as close as you will get to a real T.Rex and live to tell about it. This dinosaur is simply the finest animatronic dinosaur made in the world. We empower kids to learn by doing. We have Drumheller's largest fossil and souvenir gift store - be sure to drop in and browse. What is so special about our Dinosaur Discovery Centre? 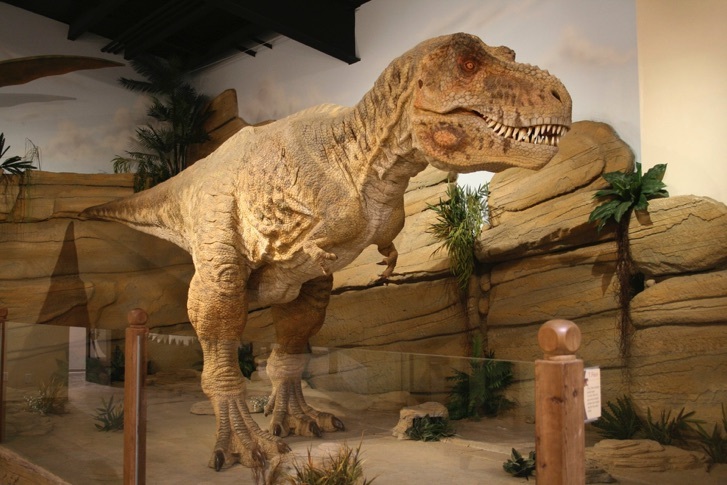 Fossil World Discovery Centre delivers family fun in a hands on dinosaur rich learning environment. Kids want to get involved and do activities. Learning happens best in a process called "creative play", that is our speciality at the Fossil World Discovery Centre. Family memories are built around extraordinary experiences that the family does together. Fossil World is a kid friendly natural history museum edutainment experience. We added 10 new animatronic dinosaurs and remodeled our museum in 2017. Adults also love Fossil World. We have over 1,000 real fossils on display. These real fossils will entertain adults as their kids do a fossil dig or climb in the play area. Our fossil exhibit is a compliment to the fossils and experience of the Royal Tyrrell Museum. Our museum is a family fun experience where activities and entertainment enhance the natural history learning process.